This page describes how to install OpenSensorHub (OSH for short) binary release so you can test it on your own platform. The process is actually really easy thanks to the use of embedded Jetty, so it should not take you more than 5 minutes to get a running OSH instance on your machine. (NOTE: Installation on Android phones and tablets is through a separate APK file). In order for OSH to run, you will need a working installation of Java JDK 7. 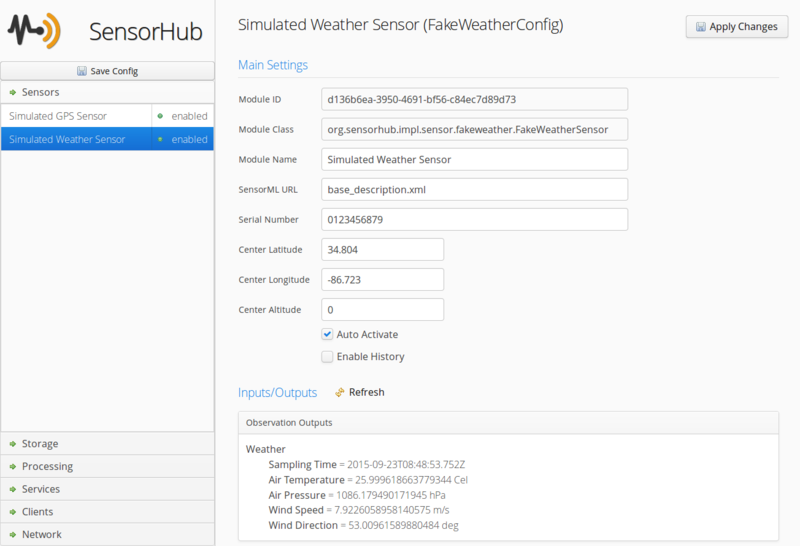 On Linux, we have successfully tested SensorHub with both OpenJDK and Oracle JDK. Note: This release has been tested on Ubuntu Linux, MacOS X and Windows 7. Also take a look at this simple demo client that connects to the fake GPS live feed through websockets to display it on a map using OpenLayers. You can easily reproduce this locally. More example data feed are also available Here. You can connect to the Admin Console at http://localhost:8181/sensorhub/admin. When active, the console allows you to manage all OSH modules including sensors, processing chains, storage units, as well as service interfaces such as Sensor Observation Services (SOS) or Sensor Planning Services (SPS). See the Logback Documentation for more details.